I think part of the reason I have such a derogatory attitude about the pumpkin spice craze each fall is because, quite often, there is no pumpkin involved. Y’all, pumpkin does not taste good. Pumpkin actually tastes (and smells!) pretty gross. Have you ever licked the spoon after scooping out pumpkin from the can? If so, did you ever do it again? That’s what I figured. What everyone actually likes – including me – is the spice. The cinnamon, the nutmeg, the cloves. And those? 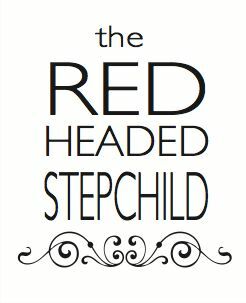 Those I can totally get behind! 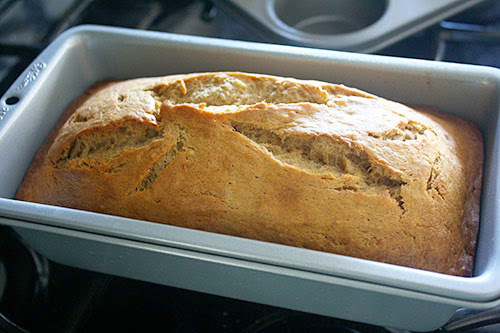 So in the spirit of pumpkin spice season, I humbly offer: spiced banana bread! This recipe I used is supposed to make two small-ish loaves of banana bread, FYI. Normally I’d halve that – easy enough to divide with two eggs and four bananas in the original source! But since I had all the ingredients on hand (i.e. smelly bananas that I needed to do something with), I ended up making a big loaf and extra muffins instead. So for the record, I really don’t think this makes a ton of batter. But if you end up making two loaves, one could be frozen or shared with friends!... though you guys know, I’m gonna hoard it for myself. We start with the bananas. Mash ‘em by hand if you want, but I’m partial to the “decimate them in the stand mixer” method. 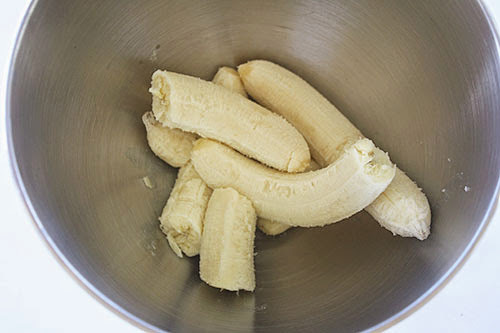 To the mashed bananas, add half a cup each of white and brown sugar, a teaspoon and a half of cinnamon, a teaspoon of nutmeg, half teaspoon of salt, and a sprinkling of cloves. (I added more cinnamon and nutmeg to compensate for less cloves, and honestly, because I really wanted spicy banana bread.) Or – or – you could just add a couple teaspoons of pumpkin pie spice, plus the salt. Same difference, really. Either way, mix! About this time, someone could wander into your kitchen and ask “OMG ARE YOU MAKING PUMPKIN SPICE ____?!? !” Because it smells exactly the same (but better than if pumpkin was actually in it). Anyway! 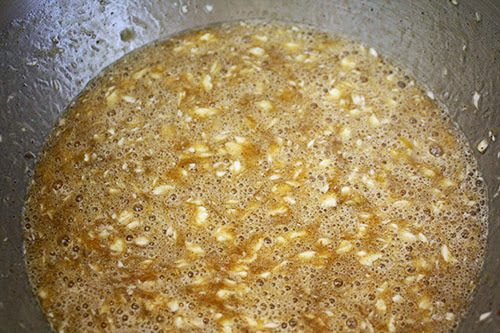 Then add two eggs, a stick of softened butter, and a teaspoon of vanilla. Mix again! 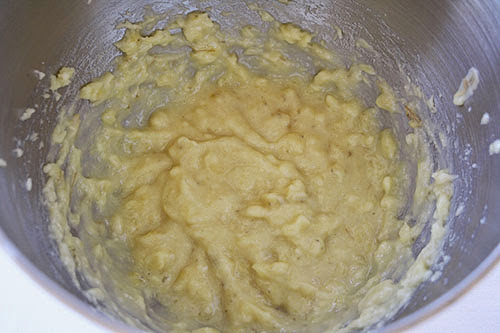 The butter doesn’t incorporate as well as if you started by creaming the butter and sugar together, nor as if it were melted (which the recipe calls for). But it’s good enough for our non-master-chef purposes, promise. Finally, time to add the dry ingredients. You guys know the drill: skip mixing in a separate bowl, and instead just add them from smallest volume to biggest, mixing after each addition. 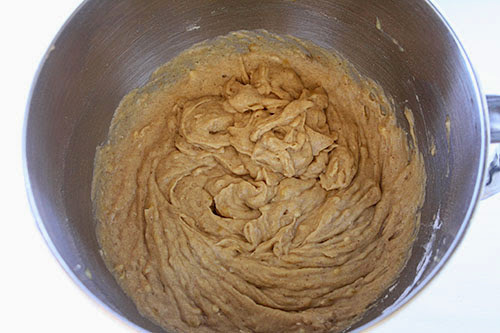 In this case, that’s a teaspoon of baking soda, a teaspoon and a half of baking powder, and two cups of flour. Mix mix mix! I love these recipes where you just dump things in a single mixing bowl. I’m making stuff from scratch and yet, so easy! And with that, it’s already time to bake. I filled a well-greased loaf pan a little over half full – which actually used about 2/3 of the batter because my pan was larger than the recipe called for (that’s why I said smallish loaves above). 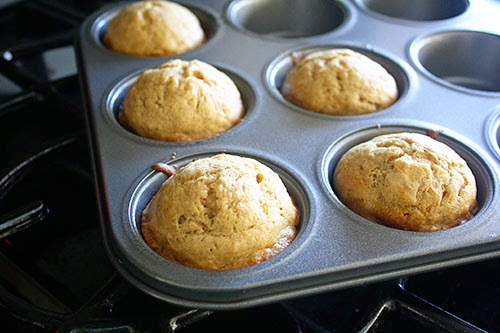 The rest of the batter went in a greased muffin tin, but I only got an additional five muffins out of it. Anyway! Pop ‘em in a preheated 350-degree oven. 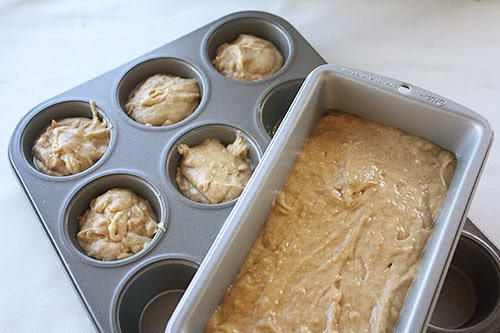 The loaf will take 45 minutes, but the muffins should be done in 15 to 18. Dat’s it! This has just a bit more spice than my previously-posted go-to banana nut muffins recipe, and of course, no nuts. I was light on the cloves based on the recipe comments, but in the end, I probably could have added what the original source suggests on top of my extra spice. And it’s still weird that it says you should get two loaves out of it – really, I could’ve put it all in my one (standard-ish sized, I think!) loaf pan and made one massive banana bread, if I had the patience to let it bake all the way through. Still! Of course, I’d take ‘em over pumpkin anything, any day! The bananas keep it all nice and moist, and the spice is perfectly seasonal. But you’d find these tasty any day of the year, really – especially now! Enjoy! I agree the spice is the primary star and the added chemicals are such a sham. But in my fridge right now is a lovely bottle of pumpkin spice simple syrup that I made myself following: http://themessybakerblog.com/2013/09/09/homemade-pumpkin-spice-syrup/. And it is good and delicious on pancakes, biscuits, and even ice cream, i.e., if you like to have it still during the cool-cold months but want to "season" it up a bit. I gotta admit the pumpkin by itself is not very good at all. You are right there. But that's w/o the sugars. And I don't get adding the pumpkin and then straining it out. That's fairly dubious for this to have any nutritional value. So I let most of it stay in the syrup. Then I have a last swallow of pumpkin pie-ish nutritional gunk at the bottom of my cup to look forward to every time. It makes me happy. And having said that, I think I'm going to go have a cup right now. Yes. :-) Yum!